The S&P 500 and the Dow each slide 0.6% and the Nasdaq falls at least 1% for the third consecutive day. 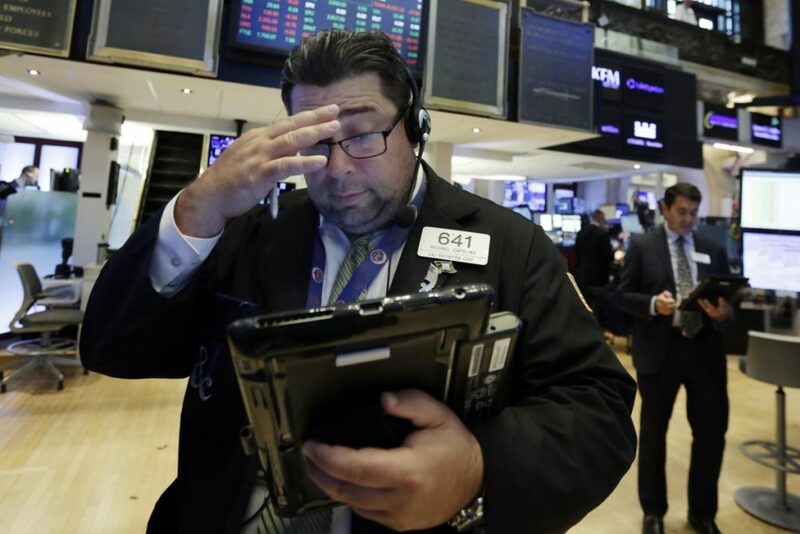 NEW YORK — Technology stocks tumbled for the third day in a row Monday as a sharp reversal for some of Wall Street’s recent favorites worsened. Major U.S. indexes skidded. Technology companies have done far better than the rest of the market in recent years, but they’ve fallen after Facebook and Twitter both reported weak user growth in the second quarter. Microsoft and Alphabet slumped Monday and Facebook, Twitter and Netflix have all fallen at least 20 percent from their record highs earlier this month. “Is the stock 20 percent less valuable, or was it misvalued to begin with?” said Mark Hackett, chief of investment research at financial services firm Nationwide. Still, Hackett says the drop for high-flying technology companies could become a good thing for the market if investors focus on companies with steadier revenue and more cash, including software makers, banks and industrial firms. “It would be nice to see a broadening of the strength,” he said. Elsewhere, energy companies climbed along with the price of crude oil, but industrial companies like Caterpillar continued to lose ground. Meat producer Tyson became the latest company to cut its profit projections and point to tariffs. The S&P 500 lost 16.22 points, or 0.6 percent, at 2,802.60, and the Dow Jones Industrial Average fell 144.23 points, or 0.6 percent, to 25,306.83. The Nasdaq composite has more technology stocks among its ranks, and it fell 107.41 points, or 1.4 percent, to 7,630. The Nasdaq has fallen at least 1 percent for three days in a row, which hadn’t happened in three years. Smaller companies fared as badly as larger ones. The Russell 2000 index slid 10.21 points, or 0.6 percent, to 1,653.13. Twitter dropped 8 percent to $31.38, extending its 20.5 percent plunge on Friday. Facebook fell another 2.2 percent to $171.06. Netflix, which reported weak subscriber growth in early July, fell 5.7 percent to $334.96. Hackett, of Nationwide, said that when investors value companies based on measurements like user growth and subscriptions instead of more traditional figures based on earnings, the stocks become vulnerable to big drops. Even with its recent tumble, the technology sector of the S&P 500 is up almost 26 percent over the last year. The S&P 500 itself is up a bit more than 13 percent over that time. Energy companies climbed as the price of benchmark U.S. oil spurted higher by 2.1 percent to $70.13 a barrel. Brent crude, the international standard, rose 0.9 percent to $74.97 a barrel in London. Caterpillar surpassed Wall Street expectations in the second quarter and raised its forecasts for the year as the construction market remained strong. The company said new tariffs will cost it $100 million to $200 million this year, and it will make up for it by raising prices. That initially encouraged investors, but Caterpillar gave up an early gain and fell 2 percent to $139.75. Pork and poultry processor Tyson cut its profit forecast because of rising tariffs and uncertainty about trade policies. The stock sank 7.6 percent to $58.72. Monday. The Federal Reserve will begin a two-day meeting Tuesday. The Fed has said that it may raise rates two more times in 2018, but few economists expect a move at this upcoming meeting. The Bank of England is expected to raise its key interest rate by a quarter of a percentage point Thursday as inflation remains high. The Bank of Japan will also meet this week. The yield on the 10-year Treasury note rose to 2.97 percent from 2.96 percent late Friday. It’s been climbing for the last couple of weeks and is close to breaching 3 percent for the first time since May. CBS stock plunged again as investors wondered if the broadcaster will replace longtime CEO Les Moonves soon. On Friday, a New Yorker article quoted six women who accused Moonves of sexually harassing them. CBS says Moonves will remain CEO while an outside counsel investigates the allegations against him. The company also postponed its annual shareholders meeting. Its stock lost 5.1 percent to $51.28 Monday after a 6.1 percent drop Friday. The U.S. jobs report is usually the most anticipated piece of economic data each month, and it arrives Friday. Both the job market and economy have been strong recently, and economists expect Friday’s report to show that employers added 193,000 jobs in July. That would be a slight slowdown from June’s growth of 213,000. Gold slipped 0.1 percent to $1,231.50 an ounce. Silver rose 0.3 percent to $15.54 an ounce. Copper lost 0.4 percent to $2.79 a pound. Japan’s Nikkei 225 fell 0.7 percent, South Korea’s Kospi slipped 0.1 percent and the Hang Seng in Hong Kong lost 0.2 percent. In Europe, France’s CAC 40 fell 0.4 percent, and the DAX in Germany dropped 0.5 percent. The FTSE 100 in London was virtually flat. The dollar held steady at 111 Japanese yen. The euro rose to $1.1710 from $1.1656, and the British pound rose to $1.3135 from $1.3113.